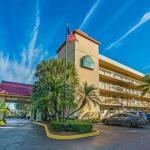 Nice freebies such as breakfast parking and Wi-Fi plus reasonable rates help our guests stay within budget at La Quinta Inn West Palm Beach Airport. At this La Quinta Inn 114 rooms on four floors include coffeemakers free Wi-Fi and flat-panel TVs with HD cable and plug-and-play features for electronics. Non-smoking rooms are available. Enjoy breakfast from the hotel's complimentary buffet of waffles hot and cold cereals pastries fresh fruit and more. Kick back by the outdoor pool wash clothes in the guest laundry and make use of copy services. The front desk is open around the clock for added convenience. Pets are welcome for a fee and parking is free. The hotel is off Florida's Turnpike at Okeechobee Boulevard La Quinta is six miles west of Palm Beach. Points of interest within three miles include Crosstown Plaza Emerald Dunes Golf Course and Northwood University. Palm Beach National Golf Club is 10 miles south. Palm Beach International Airport is five miles away. Dogs up to 25 pounds are allowed for no additional fee; there is a pet policy to sign at check-in. A contact number must be left with the front desk if there is a pet alone in the room.